I am an avid reader of nonfiction books specifically directed at business and development. 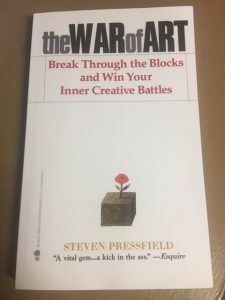 I came across “The War of Art” last year and consumed it first in audio form while working in my shop. After listening to the book multiple times and gaining great insight every time, I have added this book to my list of “Must Reads” for anyone wanting to succeed in their business and personal life. If you are a creative in any field, this book will bring to the surface those things we all do that sabotage our focus and productivity. Whether your gifts and talents are put to use as a hobby or they are the sole form of revenue for your household, using these talents in a way that the universe calls for you to do is not something you can ignore. What Pressfield calls “Resistance” sets up shop in our lives with a sole purpose to keep you from that which your guts tell you has to be done to be complete and happy.